“I want to take my kids on a trip. We have to have ocean view rooms; it has to be all-inclusive; and it has to be a non-stop flight.” This was what my Mom wanted for her upcoming 90th birthday celebration which would be in the dead of winter. I’m not a person who does cruises or beach vacations. I like to explore, meet people, visit museums and cultural sites. But how could I refuse my Mom’s wishes, much less turn down an all-expenses-paid trip to a tropical island! The irony of the whole plan was that my Mom is no beach bunny. “I really don’t like sand,” she says. She also shuns the sun, the result of 48 years of nagging from my dear father. But she’d lived in Florida and had spent time on the Jersey shore where she’d passed many an hour gazing at the waves and soaking up the ocean breezes. She was determined to see the ocean again. When my Mom, her four children and our spouses all boarded the charter flight to Punta Cana, Dominican Republic, I hailed it as a minor miracle. Mom had managed to get all of us, now in our 50’s and 60’s, to drop everything and take off together for a full week. Together - - this was more family togetherness than we kids had had since we were twelve years old. The resort was a five-star luxury place on sprawling grounds at the far end of a string of resorts that run along the magnificent beaches of Punta Cana. Eight restaurants offering various cuisines were open to us for dinner. Any drink we wanted was available at the many bars scattered around. The four-foot-deep pool went on forever, and thatch-covered canopies and chaise lounges invited us to plunk down with a book, grab a towel and stay put for hours. Down on the beach, which we could see and hear from our spacious rooms, there were beds and chaises on which to recline and indulge in whatever drink we requested from the waiters who trudged through the sand. Every night we had musical programs. By now I’m sounding like a promo brochure for the place. 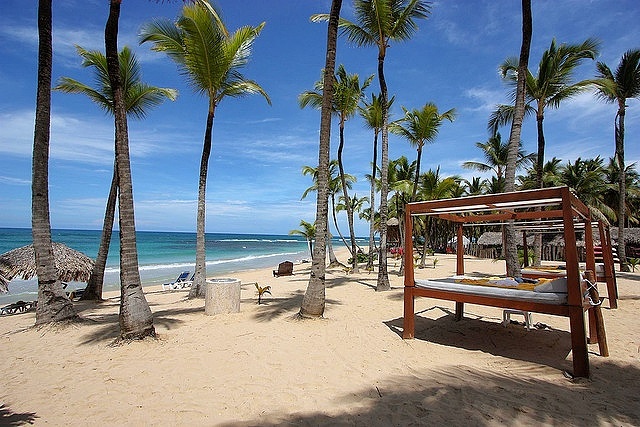 But the truth is that by the fourth day, I was chomping at the bit in this remote outpost in the Dominican Republic. Any excursions were at least a 45-minute drive away, and they were all very “touristy” -- dune buggies on the beach or a zipline trip over a canopy. On Mom’s actual birthday, she was eager to go to a craft market where we hoped to see actual, local crafts. She, of course, didn’t need a thing, but was indulging in nostalgia for the many markets she had visited on trips she took over the years. We booked a taxi van and seven of us drove 45 minutes to a market I’d read about. Hoping for quality souvenirs, we were instead confronted by shop after shop of mostly the same merchandise, generally shoddy, cheezy and touristy. Colorful, mass produced paintings in any size you wanted, beaded jewelry, crude ceramics, pareos made in China. The vendors were smiling and friendly, but we were instant marks as they hounded us to enter their shops, hungry for a sale. We jived with everyone and watched the checkers games they played to fill time. Playing checkers at the craft market. I didn’t say a word to my Mom because I didn’t want to appear ungrateful for her generous invitation, but I began to wonder: where’s the culture in a five-star all-inclusive resort? I decided there wasn’t any. But then I thought about Nilsen, the bartender at the Martini Bar, who remembered how I wanted my expresso when I stopped by after breakfast and again after lunch. He joked around and called me “sweetie.” He gave everyone equal attention as he mashed limes for a mojito, poured a shot of extra viejo rum for my husband to sample, passed out a glass of the local herbal drink called “mama-juana,” mixed up a latte or poured a glass of Presidente beer. A stalk of celery decorated his Bloody Mary, a skewer of pineapple his pina colada. He was the front man, the performer, but he’s backed by an able cast of hundreds who delivered more of this or that, who cut up the fruit, who washed the cups and glasses. This resort was really a small village, all geared to making a lot of foreigners, mostly Americans, very happy. Nilsen at work at the Martini Bar. Maybe the staff, who always smiled, who always went out of their way to please the guests, were the culture. Maybe I was unjustifiably dissing a good-natured, people-pleasing resort. Wasn’t it stupid of me to opt out of the Dominican feast and performance down on the beach? Shouldn’t I have been eager to sample local foods and see native dances, no matter how they were slicked up for the tourist? The next morning, I chose to sample the mangu (boiled mashed green plantains with sauteed onions) and the few other Dominican specialties that were on the buffet table, trying to make up for my lapse the night before. My brother met a man who spends a month at the resort every year. I think I’d go crazy. Too much of a good thing, perhaps. Too much like Disney’s Magic Kingdom. But, on the other hand, it was so easy to eat whatever we wanted without ever seeing a bill. Even though I was somewhat disappointed by the resort’s attempts at French or Asian food, I acknowledged that they were only trying to make magic for us, their guests. “Excellente,” was the regular response when we asked a waiter, “Como estas?” The staff is highly trained. I hope they are also highly, or at least well, paid. Everyone who walked by me invariably greeted me with “hola!” and a smile. Their niceness, general courtesy and happy demeanor invited the same response in me. So even though it wasn’t my idea of culture, it was a culture nonetheless. And how can you complain in the Magic Kingdom? I wondered if the resort culture was all fake. I thought about the stories the staff must tell about the fat, the drunk, the rude, the nice, the friendly, the crazy guest! The perfect staff is, after all, human, and grousing a bit is human nature. And then I wondered if people could really fake being happy in their work. There were, of course, imperfections in paradise, and I noticed a lot of them before my new found appreciation of the all-inclusive, guest-pleasing, five-star culture. There was definitely a rich vs. poor divide. I learned that Nilsen, the bartender, and his wife both work at resorts that are 45 minutes away from their home. Their two-and-a-half-year-old daughter lives with Nilsen’s mother in Santo Domingo, about four hours away. They work twelve nine-hour days with three days off. Are the staff disturbed by the luxury they work in and the seemingly rich people they cater to all day? Or are they happy, as any of us might be, to have work? Am I rationalizing? Should I just stand up and shout that I hate packaged fun, even if it is five-star, or do I wimp out and write about the culture of luxury in another country? I may be hiding behind the curtain of rationalization when I write the following, but here goes. I wish the sights and chaos of Santo Domingo, which were too far away, were enough to draw thousands of tourists to the Dominican Republic, but that’s not the case, any more than it is for other places, like Mexico. There are many ways to travel. Plunking oneself down in an all-inclusive resort where you can eat whatever you want, bask on a gorgeous beach, meet smiling people, or read that novel you’ve wanted to get to is an easy way to go. I couldn’t do it for a month, but now I understand a bit more why people do it. They do it because Raquel, the hostess at The Grill, giggles while waiting to seat guests, and explains that she got distracted by all the cute boys. They do it because Martirez, the happy omelet maker at the breakfast buffet, juggles three skillets, flips each with one-handed ease, tosses the finished omelet into the air, and catches it on the plate. He is proud of his performance -- and so are the guests. They are drawn in by Samil, the waiter, who walks around like a gunslinger, wielding a carafe of coffee in one hand and milk in the other, serving each guest according to his preferences: more coffee, less milk; half and half; just refresh my cup. They discover little delights on the grounds of the resort, like turtles basking on the rocks in the small lagoon in the lobby. One guest stopped to bite off a chunk of his apple to feed to them. Bright macaws, one with a red head, the other blue, cocked their heads at the camera. My brother was caught off guard by their sharp claws and fast beaks, and lost a button on his shirt -- bitten off and crushed in a second! In the botanical garden, graceful pink flamingos curled and uncurled their long necks, emitting a very ungraceful squawk at dusk, which was answered by the macaws. A variety of ducks paddled around the ponds. A couple of brightly-painted row boats, casually pulled up on the bank, cast a vivid reflection in the water at sunset, inviting photos. I watched the stately white egret as it made a solitary trek through the shallows, looking for dinner. The staff placed flower petals on the dinner table and around our jacuzzi after turn-down at night. I have to admit that, like the other guests, I enjoyed the many little pleasures. A colorful row boat at the water's edge. By the end of the trip, I had adjusted my attitude and realized that I wasn’t rationalizing. It was, after all, a good vacation. I read a few books, walked on the beach, swam in the pool, and hung out with my family. Most importantly, my Mom spent her 90th birthday as she wanted to, with her kids. “It was exactly what I was hoping for,” she said when she got home. That made it all wonderful. Laurie Gilberg Vander Velde and her husband Michael are enjoying a new life in Santa Fe, New Mexico where they are determined to maintain their appreciation of their new home state. They will continue to explore other parts of the world as opportunities arise.